Early adopters of the LEAF will recall that Nissan originally estimated —but could not guarantee— that its battery should retain 80% capacity after 5 years, and 70% capacity after 10 years. As the months and miles accumulated, some of the first owners exceeded those benchmarks, but others fell significantly short, which prompted the automaker to eventually offer a capacity warranty on the battery pack. Specifically, if a LEAF lost four bars on its capacity gauge before 60 months or 60,000 miles (whichever came first), Nissan would repair or replace the battery for free. *Editor's note: This post, authored by Mark Larsen, appears on his website. Check it and other EV-related articles out by clicking here. With the advent of the new 30 kWh battery in the 2016 LEAF SV and SL models, Nissan has extended that warranty even further to 96 months or 100,000 miles, as stated in the relevant section of the warranty booklet on the right. In essence, the automaker has thus established a new, more reliable benchmark for capacity loss than the original estimates, this time backed by a guarantee. As stated in the warranty, the threshold for said benchmark is the loss of the fourth capacity bar. The Nissan LEAF Wiki Website claims that, according to an April 2011 Service Manual (page MWI-23), the first bars will disappear when the capacity drops below the percentages in the table on the left. 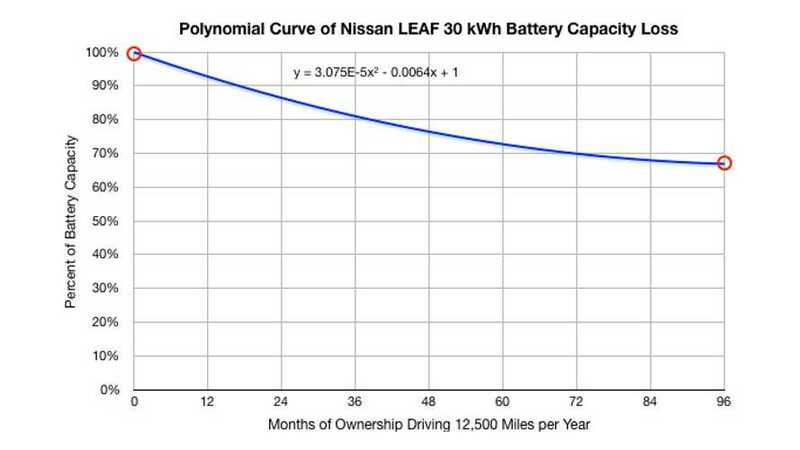 Unless Nissan has since reprogrammed the percentages for those bars, we can therefore assume that that the battery should retain more than 66.25% capacity for 8 years or 100,000 miles (whichever comes first). Using those parameters as a new benchmark, I calculated the polynomial curve of capacity loss throughout the warranty period, plotted in the graph down below at the bottom of the page. 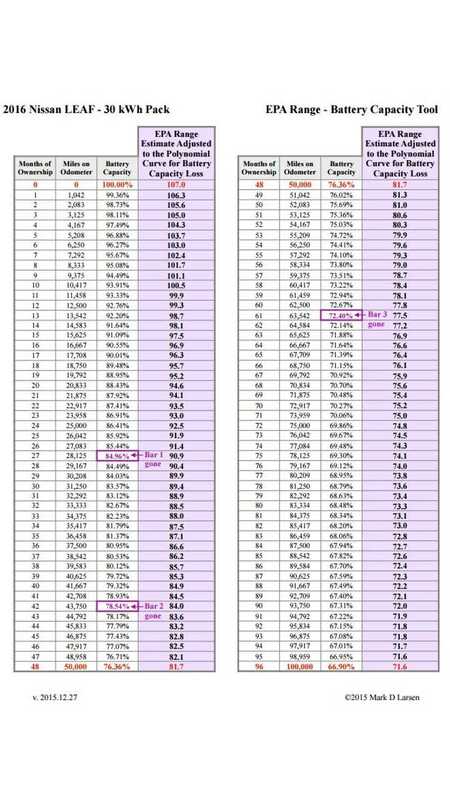 I then posted the breakdown in the PDF chart at the top of the page. Owners of 2016 SV and SL models could therefore consult the chart to determine how their capacity and range compare with the calculations according to the new warranty. What is most intriguing is that, despite the larger battery and longer warranty, the new calculations actually predict lower percentages than the original benchmarks. For example, after 3 years or 37,500 miles, the chart for the 2011-12 LEAF estimated 86.68% capacity. However, the new benchmark predicts only 80.95% capacity after the same number of months and miles. My hope is that this is an indication that Nissan has learned a valuable lesson, and has resolved to henceforth underpromise and overdeliver.